I was inspired by an old blog and Facebook friend, Katie Barry, to have a go at making home-made ketchup this weekend. I had often intended to try it before, as this condiment is one that we (as Katie points out in her own housekeeping blog) all have in our condiment collection. 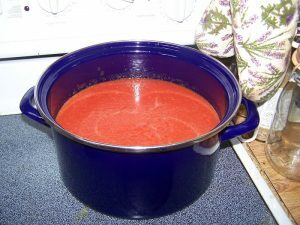 I was put off some of the recipes for it in my own collection of canning books, because they called for simply awesome quantities of fresh tomatoes, and unless and until my garden starts producing tomatoes by the ton ... well, I like fresh home-grown tomatoes too much to condiment them. 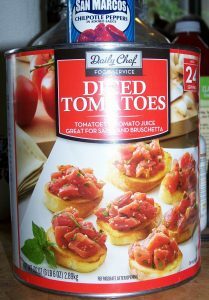 But Katie's recipe started with canned diced tomatoes, and I thought ... oh, that is doable. One six-pound can of diced tomatoes from Sam's Club, and I am in business. I took a recipe from one of the canning books, since I do want to can the resulting ketchup for later use ... and I would also like to duplicate the splendid spicy Whataburger ketchup, too. Excellent stuff that is, but home-made might be even better. On consulting the listing of contents on the label of Whataburger Spicy Ketchup it seems that the secret ingredient is red jalapeno pepper puree ... and red jalapenos were not available in my local HEB ... although I may have my own from the garden in a month or so, by allowing the jalapeno pepper plants to ripen all the way. But I had it in mind to make ketchup this very weekend, and I thought that adding a smidgeon of smoked chipotle peppers in adobo sauce would certainly amp up this batch to an exciding degree of spicyness. So – amend the recipe in Sunset Home Canning for spicy ketchup, by using canned diced instead and pureed the entire six-pound can of diced tomatoes with a whole onion and one peeled and seeded red bell pepper ... which had been peeled, sealed in Foodsaver bag and frozen. 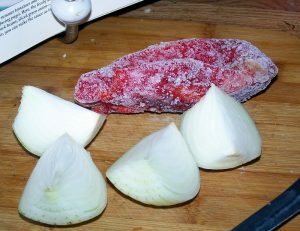 Simmer and reduce the resulting puree over medium heat for about an hour or until reduced by half. 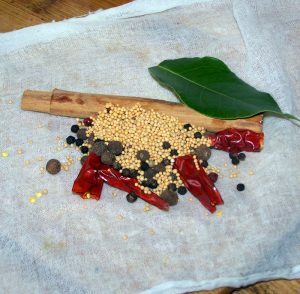 Tie into a piece of clean cheesecloth 1 ½ teaspoon each of mustard seeds, black peppercorns and dry basil, 1 teaspoon whole allspice, one dried cayenne chili pepper, a large dried bay leaf and a 2-3 inch length of cinnamon stick. Add the spice bag to the reduced tomato puree with ¾ cup packed brown sugar and ½-2 teasp. Paprika. Continue to simmer, lowering heat gradually and stirring frequently as it reduces to approximately 1 quart. In the last fifteen minutes, I stirred in ½ cup cider vinegar, which had been pureed with 1 3-oz can of chipotle peppers in adobo sauce. Salt to taste – and we agreed that it did have a rather pleasant chipotle smokiness. If it had been just for myself, I would have put in another 3-oz. can. It came out to three pints and a bit – the recipe said it would yield two pints. Likely I could have reduced it a bit more, but it did seem quite thick enough already. Katie's recipe called for powdered herbs and spices, rather than the whole version steeped in a cheesecloth bag. I'll experiment with this in the next batch, and see if it makes a difference in flavor. I poured it all into three sterilized pint jars and processed in a boiling water bath for 20 minutes. The extra bit went into a plastic freezer container – waste not, want not. It came out a very nice red color, and a bit grainer than the commercial version – but well-worth the effort and the Number 10-can.